I want you to sit back and think of beautiful blue oceans, white beaches and chilling in the shade. Why? Because today I’m taking you to Jamaica baby, with my Jerk Chicken Bowl! 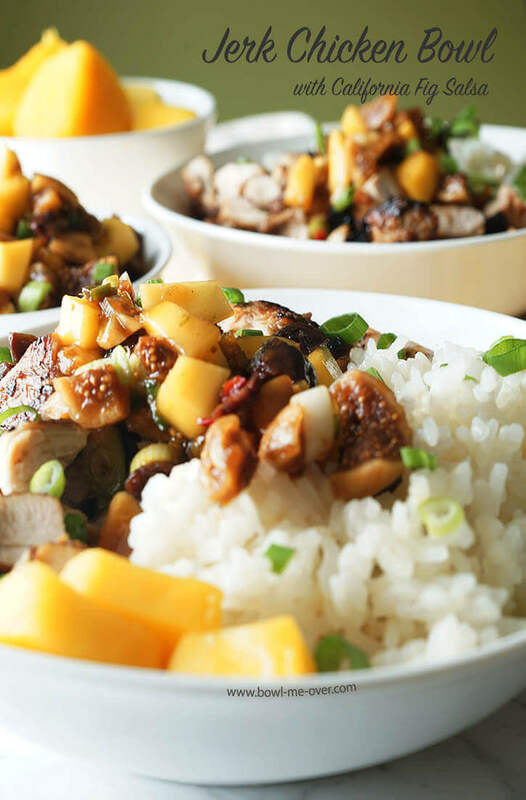 Jerk Chicken Bowl is a little sweet, a little spicy and full of BIG flavor! Well, I’m not taking you to Jamaica literally – but we’re going to do the next best thing and I’ve enlisted the help of my neighbors at Valley Fig Growers to help me! Valley Fig Growers, aka Blue Ribbon Orchard Choice and Sun-Maid Growers! And I’m super excited to share this new recipe with you! You know Valley Fig Growers right? They are my neighbors located right here in in the Central Valley in Fresno. Today I’m going to share with you a recipe I developed using their awesome California Figs! 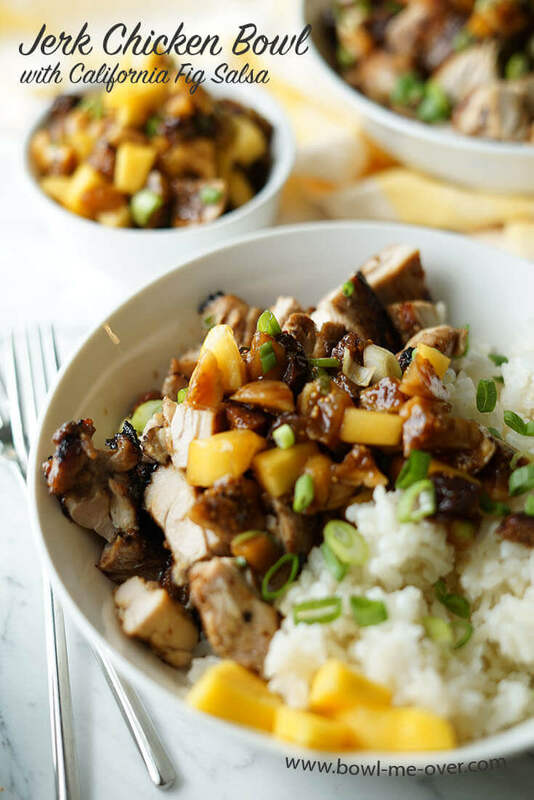 Grab your fork and I’ll show you how easy this jerk chicken bowl is to make! If you’ve never had traditional “jerk” flavors, here’s what to expect. Jerk Flavor is a mixture of smokey heat and sweetness. The heat comes from scotch bonnet peppers. These peppers are insanely hot, so a little goes a long ways. They have a fruity, unique flavor. 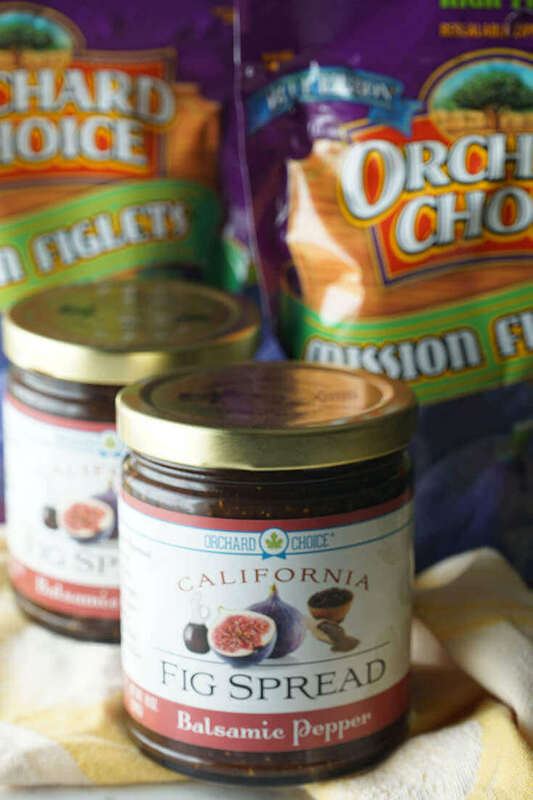 The sweetness comes from the California Fig Spread. It’s a perfect combination and together makes an easy marinade for the jerk chicken. Can’t find scotch bonnet peppers? You can substitute with habanero or Thai chili peppers. These peppers are HOT – protect your hands and do not touch your eyes. Be SURE to wash your hands immediately after handling them! 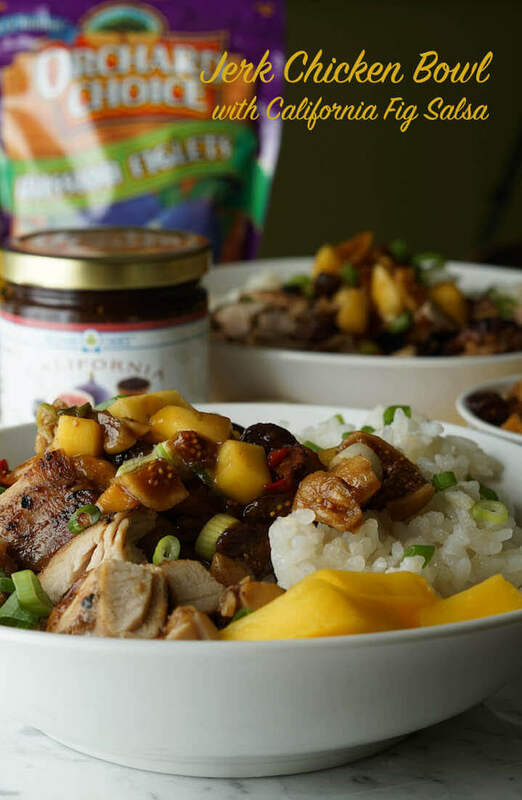 Jerk Chicken Bowl with California Fig Salsa! For this recipe I used chicken thighs, but if you prefer white meat, switch it out and use your favorite. The salsa has California Figs, mango and Fresno chilies. It mimics the flavors of the marinade with hints of warm spices. 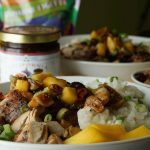 Jerk Chicken Bowl made with Orchard Choice California Fig Spread and Blue Ribbon Orchard Choice Mission Figlets! Be sure to head over to the Valley Fig Growers website and pick out your favorite California Figs to make this amazing meal! 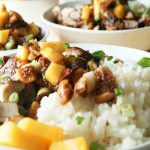 Jerk Chicken Bowl with California Fig Salsa - I'm transporting you to the Caribbean with this easy meal. Sweet & spicy flavors combine in this easy marinade. Big flavor and an easy meal! Roughly chop the green onions and mince the garlic. Add to a blender or food processor. Remove the stem from the pepper and the seeds and membranes, but be careful handling the pepper. Touching the pepper/touching your eyes will burn! Roughly chop the pepper, add it to the blender. Add all of the remaining ingredients to the blender with the exception of the chicken. Blend until smooth and all ingredients are combined. Pour into a ziplock bag. Add the chicken thighs. Marinade for 3-4 hour or overnight. When you are ready to grill, remove the chicken from the marinade and pat dry. Allow to come to room temperature before grilling. Grill until cooked thru and juices run clear. Dice into bite sized pieces. Serve topped with California Fig Salsa over rice. Enjoy! California Figs, mango and warm island spices combine for this easy salsa. So yummy, you're going to love these flavors! Got leftovers? Stir it into Greek Yogurt for an delicious satisfying breakfast or snack! Dice the figs and the mango. Thinly slice the green onions. Zest and juice the lime. Remove the stem from the pepper, seeds and membrane - dice. Add all of the ingredients to a bowl and mix throughly. Top over jerk chicken bowl and enjoy! Since you’ve gotten this far that means you like big flavor like I do, so let me suggest a couple more recipes! First up Ja Makin’ Me Crazy Mango Jam – using mangos and a touch of raspberries, this jam combines making a serene color transporting you to a tranquil Caribbean sunset! Not in a bowl, but I can tell these bites really pack in the flavor – Cuban Sliders! Perfect for tailgating or any gathering they have big flavor and are easy make ahead dish! Cuban Sliders are definitely a family favorite! I hope you enjoyed your Caribbean Sea cruise with all of these delicious island flavors! Be sure to try this yummy recipe and swing back by and let me know what you think! p.s. Got leftover salsa? Stir it into Greek Yogurt for an delicious satisfying breakfast or snack! 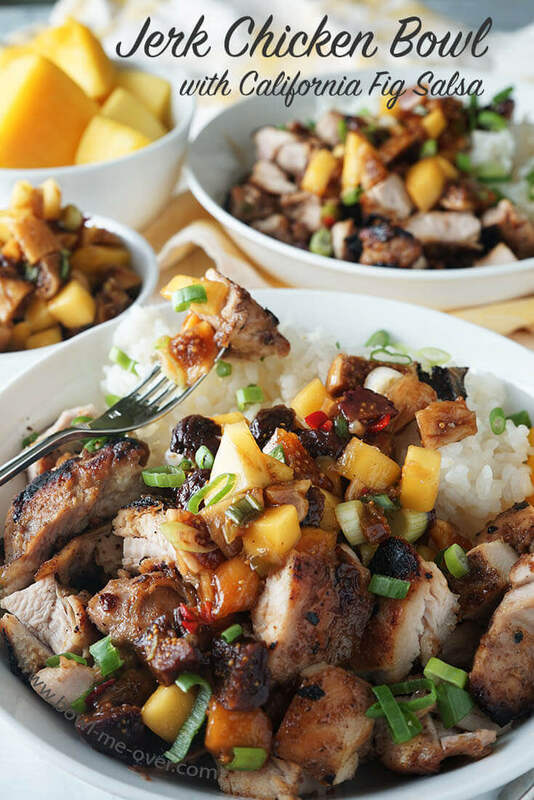 Jerk Chicken Bowl with California Fig Salsa – big flavor in each delicious bite! Mmmmm! Give me a fork! I just want to dig in right into that photo on the screen! 🙂 🙂 🙂 Love this recipe! Not only I love everything fig, I also love all sorts of sweet-and-sour tasting dishes. I’d never think of adding figs to the chicken, but it just makes so much sense! Genious! Thanks, Debra! Thank you so much Liza!!! It really is a wonderful recipe – I just love figs and they are the perfect with this easy meal – love the big flavors and spice too, yum!!! That is such a delicious looking bowl, especially that fig salsa!! Thanks Manju – it’s soooo yummy! I hope you give it a try!! Oh, that fig spread is calling my name! Love how you use it in this recipe. The fig spread is SO GOOD!! I love jams & jellies and usually make my own. Their version is incredible. That on a toasted bagel in the morning? Perfection! First of all I love the flavors of jerk sauce and then you come up with Fig Salsa. It sounds so delicious with mango and those spices! Great combination Ginny! Such yummy flavors, enjoy! Oh my! My mouth LITERALLY started watering as I read the title of this recipe! How’s that for the power of the mind?! Pretty good huh?!! 😀 I hope you do give it a try Jane, it’s such a great recipe with delicious ingredients! I love this bowl!! Oh wow I love that fig salsa, gotta find a way to replicate that. You’ll just need some dried figs & mangos – bet you can find them in your area! I saw this recipe on Facebook, and thought it looked so flavorful and amazing! What a great job. My husband loves Jerk foods, so I know he’ll go for this one! I’m so happy you stopped by to check it out Debi! It’s really one of our new favorites. I love how easy it is but all of that big flavor, LOVE IT!! I hope you do too! This just looks so delicious. A perfect meal. Love the flavors. Thank you so much, it’s really a yummy meal!! I don’t know that I’ve ever had jerk chicken–this looks great! 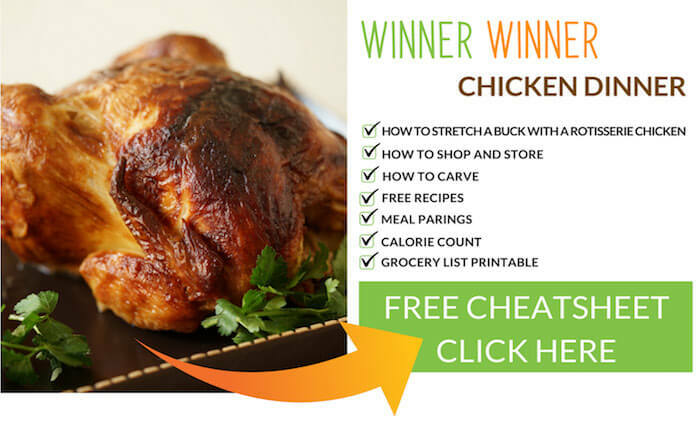 If you haven’t you should definitely give it a try Ashley – big flavors and so delish!! I love figs and this spread makes it so easy to use it in my recipes. I love everything about this recipe! That fig spread is just delicious! We love it spread on toast in the morning, YUM!!! Jamaica is my FAVORITE place on earth!! This looks so delicious!! It’s such a delicious recipe – thank you Micheala!!! I’m loving this recipe!! And your photos look mouthwatering good! Thanks so much Michelle – we just love this meal!! What a stunning dish and the fig salsa is genius! Thank you Justine – the salsa is AMAZING!!! Im a pretty huge fan of figs and this dish sounds so full of flavor and unique combinations! I have no doubt it is perfection! Then you will love this Angela – this meal is all about the figs!!! This bowl is gorgeous and I love the sweet and spicy flavor combo that’s going on! I love the buddha bowl trend way more than the smoothie bowl trend and this is top of the list! What a great use of figs!! I know right? For me most things have always been in a bowl, so this meal is right up my alley! 😀 Just love those delicious California Figs! I LOVE jerk chicken! What an awesome idea! That jerk chicken looks ace but it’s the fruity salsa that’s really making it sing for me, loving the look of the whole dish! Thanks Kavey! We’ve so enjoyed this meal, I hope you give it a try! I just saw figs in the weekly flyer for my store, and they look so good but I never know what to do with them. Now I do – this looks incredible.